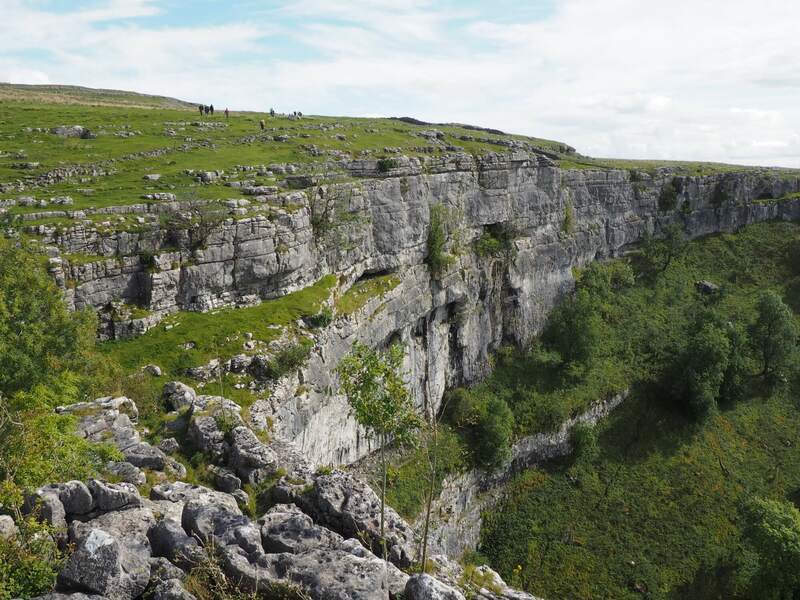 A shortened version of a classic walk in Malham’s limestone country including Janet’s Foss, Gordale Scar and the iconic Malham Cove. Several weeks ago I got a nice suprise when I was contacted by Stu, an old friend from school, who was moving back to Yorkshire with his family after a number of years living abroad. Wanting to make the most of being back ‘home’ Stu asked if I’d take him and his wife out for a couple of walks. With the caveat that I didn’t include any ‘big’ hills I decided to take them to Malham. Not wanting to overdo it in terms of distance I finally decided on this route, a shorter version of the classic Malham round that omits Malham Tarn. Grabbing one of the final parking spaces on the roadside leading into Malham we walked up into the village to then cross Malham Beck by the little slab bridge round the back of the blacksmiths. The initial walk along field paths to join Gordale Beck is pleasant ennough but I find I’m always quite impatient to enter the lovely Wedber Wood. It is at this point that the interest of the walk really begins to grow as the path passes limestone outcrops amongst the trees. Of course the highlight of Wedber Wood is the lovely waterfall of Janet’s Foss. After taking a look at Janet’s Foss we climbed out of the northern end of the woods to join Gordale Lane. Turning right on this a short way we crossed Gordale Bridge before taking the path heading up into the dramatic gorge of Gordale Scar. Although I knew what was coming it was still nice when Stu and Suthawee were both suitably impressed when we rounded the bend at the top of the path to be confronted with the narrowing gorge and waterfall. I had no intention on this walk of getting them to climb up the waterfall. As I suspected it was quite wet though to be fair there were a couple of people giving it a go. So, instead of going up the waterfall, we began to retrace our steps to Gordale Bridge. Along the way were accosted by someone from a TV crew who asked if we would be happy to be filmed talking to a celebrity chef! I had no idea who the chef was and it all sounded a bit odd (we were supposed to be filmed being invited to go to Airton to sample some food even though we didn’t have to go) so we declined and carried on our way. At Gordale Bridge we joined the Dales High Way as it slanted up a couple of pastures to pass around the back of Cawden Flats Barn to join the road to Malham Tarn. Crossing over we continued on a clear path through limestone to gain the sudden view of Malham Cove. I’ve been on the Cove many times and never fail to enjoy the walk across the limestone pavement and the precipitous views from near the edge. Once again it was nice to introduce this iconic landscape to people who had never experienced it before. All too soon we’d crossed the top of the Cove to reach the steps heading back down. At the foot of the steps we turned left to take a closer look at the face of the Cove before returning to Malham on the main ‘tourist’ path. The highlight of this final section of the walk was the trio of Belted Galloways who were enjoying a paddle in Malham Beck. All in all this was a very successful outing. Both Stu and Suthawee enjoyed themselves which was the main objective. Hopefully the walk will have inspired them to seek out more of the Yorkshire Dales. While the walk presented nothing that was new to me it is impossible not to still feel a thrill at seeing the likes of Gordale Scar and Malham Cove.